It’s always sad to leave the Cathay Lounges at Hong Kong Airport (they are amazing), but I make the journey through the terminal to the boarding gate. I board the flight to London and it is the same Cathay product as my flight from New York. The dark of night has set in and I get myself settled in the beautiful large chair which has a comfy ottoman. 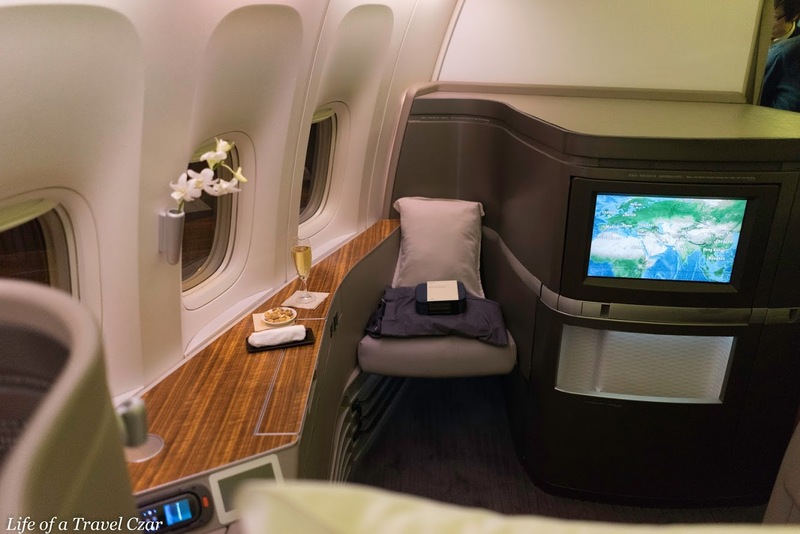 The suite is open but private enough with beautiful wood grained finishes, light beige upholstery which is padded with soft leather on the inside. 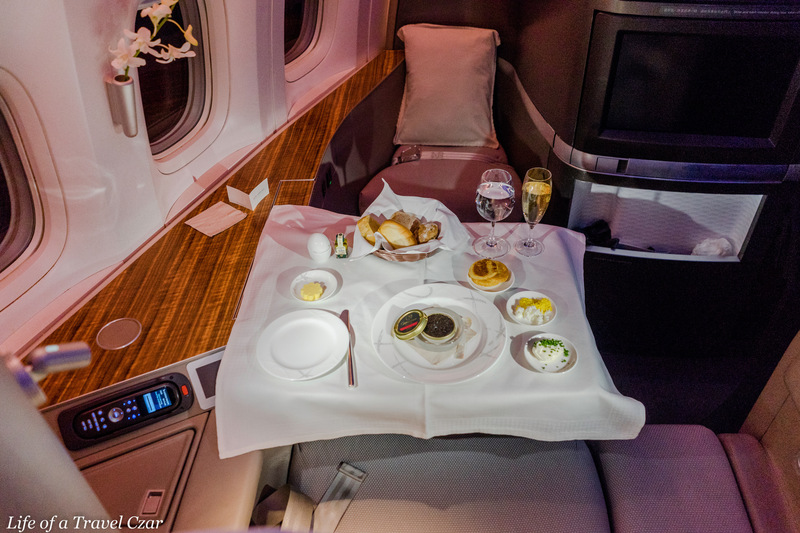 I go into more detail of Suite in my review of the flight from New York (link here). 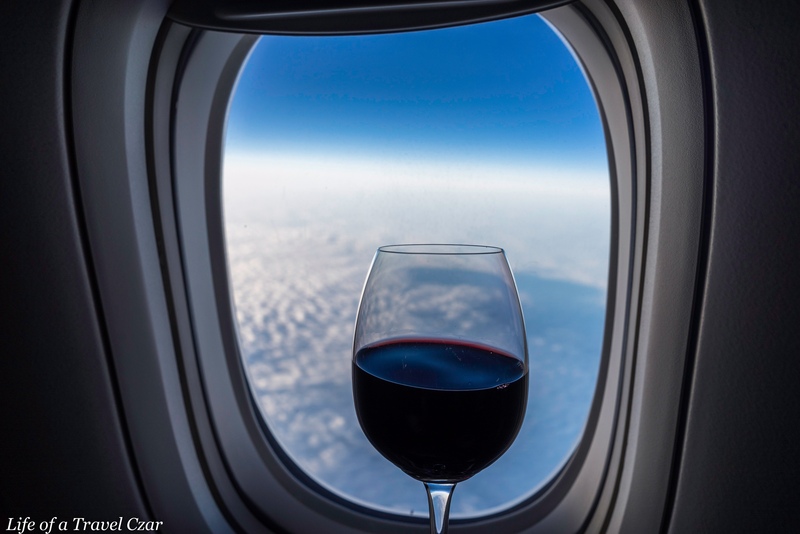 I enjoy a preflight apertif before take-off. Soon after take-off we are served dinner. The first course is caviar served with traditional garnishes of blinis, chive creme fraiche and chopped egg paired with the Krug Grand Cuvee. 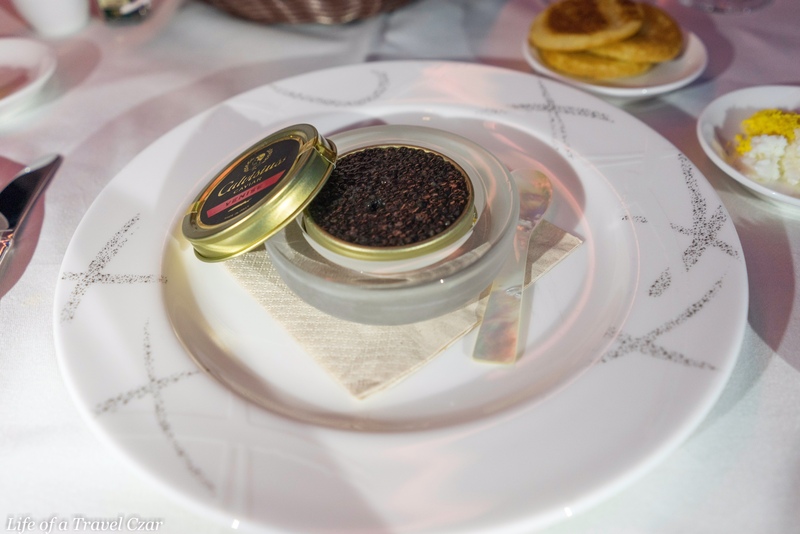 This is the same Caviar from the last flight into Hong Kong, so here’s the background on the product: “Cathay Pacific source their caviar from Calvisius. They use Calvisius Venise which is a Siberian caviar from Calvisano, a town in the province of Brescia, Italy. The area is rich in spring water and the purity of the water creates an excellent ecosystem for the sturgeon which provides the caviar. It takes approximately seven years for the sturgeon to reach maturity for harvesting and they are given the best of care throughout. Dining is influenced by the atmosphere in many ways. 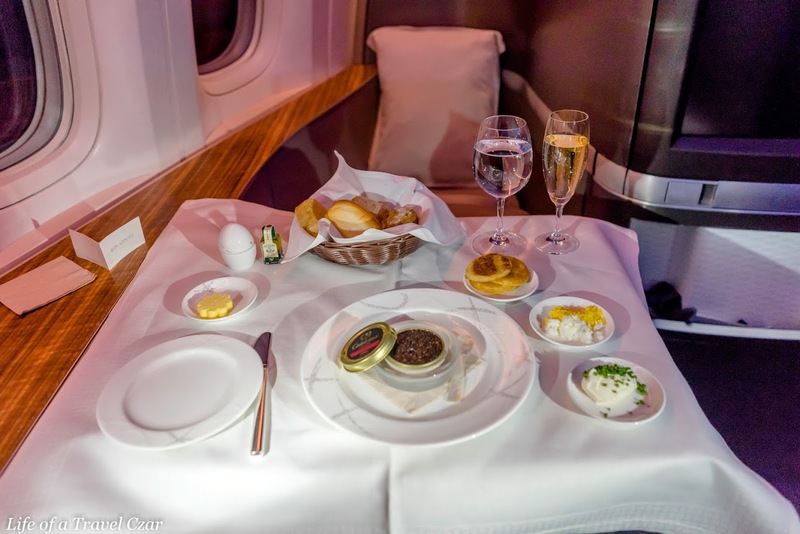 I had the same dish during the afternoon on the flight from New York, however there was sunlight beaming through the cabin and the caviar took on a real summer feel. 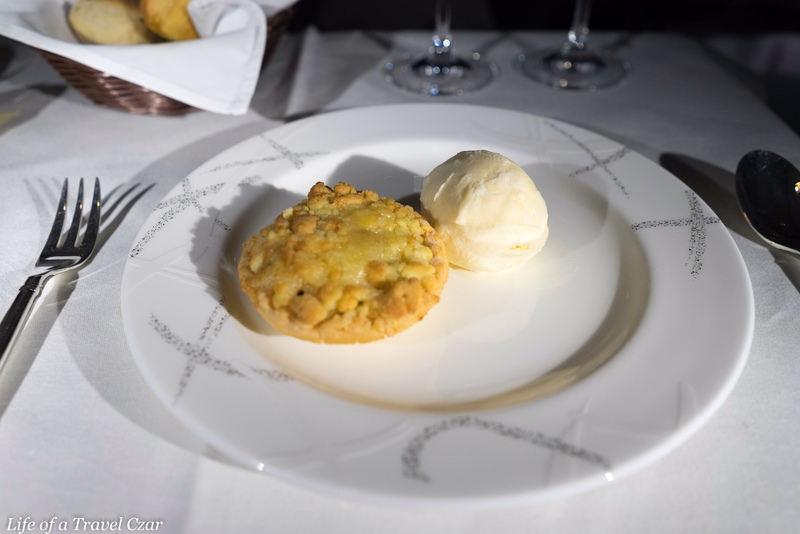 I felt transported to the French Riviera as I worked my way through the dish. 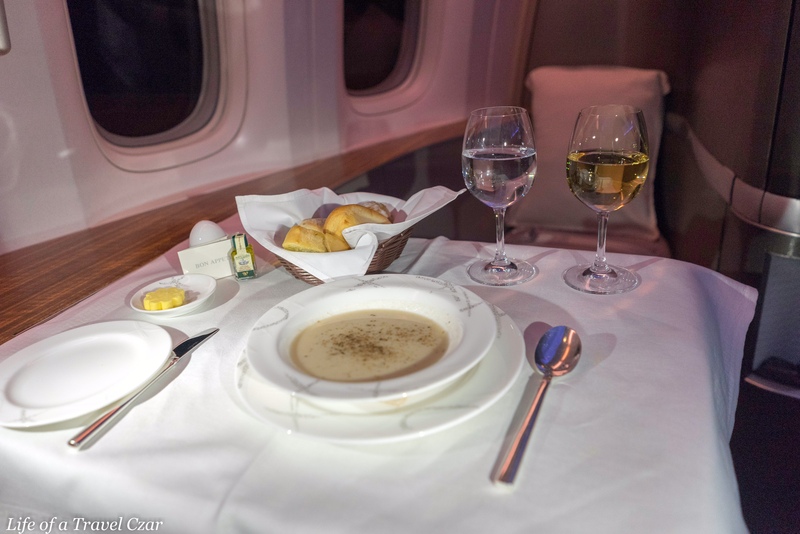 On this flight, however, the cabin lights are dimmed, the sky is pitch black and the the glow of the champagne and the buttery contrast of the blinis add a sense of luxe to the experience. It’s almost like you’re in a hidden den of a private members club in Russia. It’s funny how the same dish conveys two vastly different experiences based on the timezones. The egg, cream and blinis are the perfect accompaniment and the champagne’s tart sweetness and acidity dance effortlessly with the caviar. There is something a little magical about the whole taste experience. The soup is light and creamy with a mildness which is calming, but I do wonder whether it lacks the requisite flavour punch to be impactful. It is a decent dish which is lacking in flair. The salad is so refreshing; the crisp cold leaves and vegetables, the light airy yoghurt and the chilled prawns which are so succulent. The lightness of flavours is blunted in the finish as the tandoori flavour of the prawns flows on the tongue with a flourish of spice and zest. I paired the soup and the salad with the Chablis. Its a classic Chablis. The enticing aroma of citrus, apples, nuts and a hint of salinity allure the nasal senses. On the palate it expresses a richness of green apples, lemon with hints of herb notes which occupy the palate. An interesting salty, stony, iodine flow is present to balance the fruit and lingers in the finish. The soup probably didn’t need a pairing but the Chablis was perfect for the salad. The dish is interesting. The orange glow of the carrots was a fine piece of aesthetics. The lamb was nicely done with a smoky charred outside and tenderness and a juicy flow on the inside. There is a piece of toasted cracker below the carrots which probably wasn’t needed. The beans and potatoes were nice fillers to round out the dish. 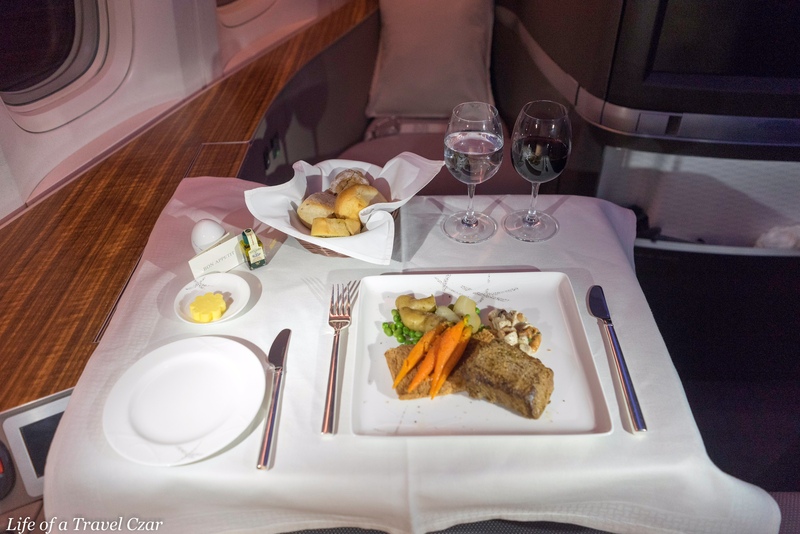 It was a decent dish but didn’t quite compare to the beef fillet on the prior flight. 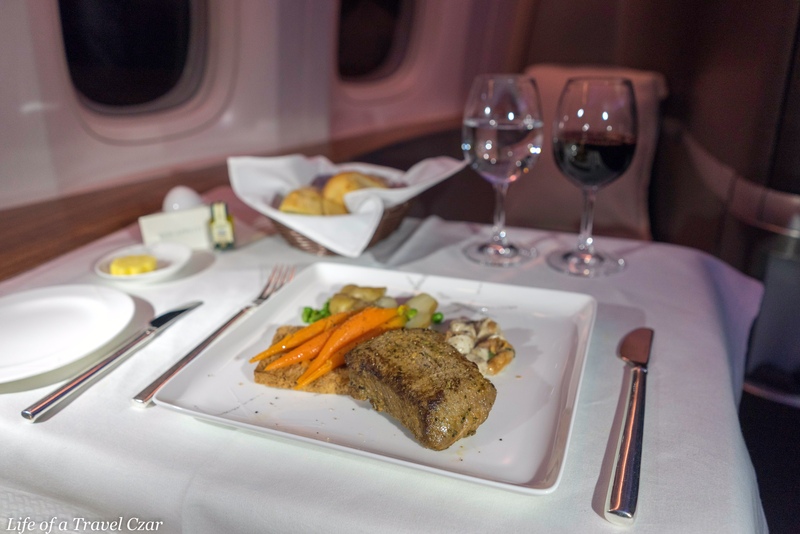 The wine pairs very nicely with the lamb and I continue with the wine for the rest of the flight. The dessert is my kinda style – not to sweet and small enough to finish off a large dinner. The chill of the ice cream is a hit with a subtle vanilla flavour flowing through the palate. The crumbly buttery tart is heaven when it fills your mouth with the moist crumbs as its formation is ruptured by your fork. The moist syrupy apple pieces hold it together and make for a wonderful contrast of textures on the palate. A nice simple dessert to finish off the night. I am so tired and need to rest. I ask the crew to make the bed and they immediately attend to it. 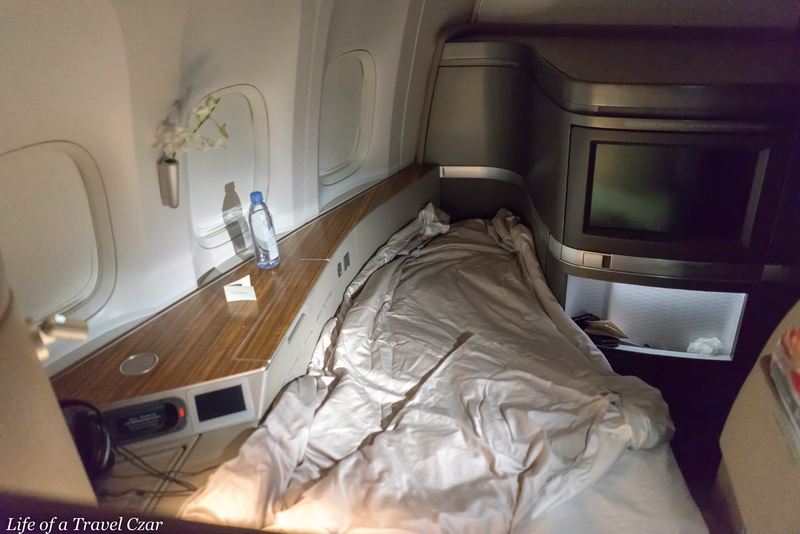 It is a very spacious bed and I change into my pyjamas (see my prior Cathay flight post for details of pyjamas and amenity kit, which were the same on both flights) and fall asleep as the plane jets through the oceans and continents enroute to London. I awake as the sun glows through the cabin. I opt for my favourite vices; a caffeine and alcohol hit to start the morning. 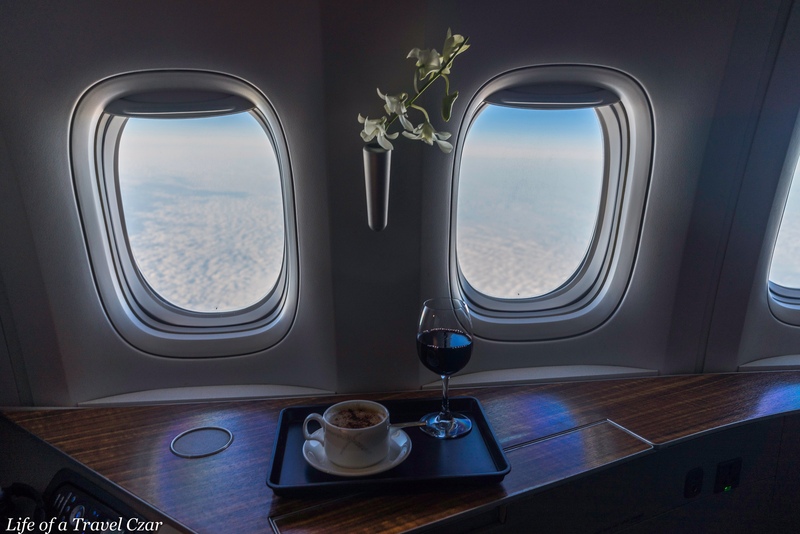 The Chateau Lynch Bages proves the perfect companion as we both sit and watch the clouds float across the aircraft. The views are quite stunning as we make our way through to the European continent. Eventually we have breakfast just prior to our arrival in London. I opt for the Dim Sum Selection. The dumplings are fine. The Crab Shu Mai and Har Gow are my favourites. The glutinous cover with the succulent seafood. Its a pure dream. The muffin and coffee go hand in hand…. and I guess you’re shaking your head at the presence of a glass of wine at the breakfast table! Don’t worry all my friends react the same way when a glass of wine finds its way into my hands during breakfast. 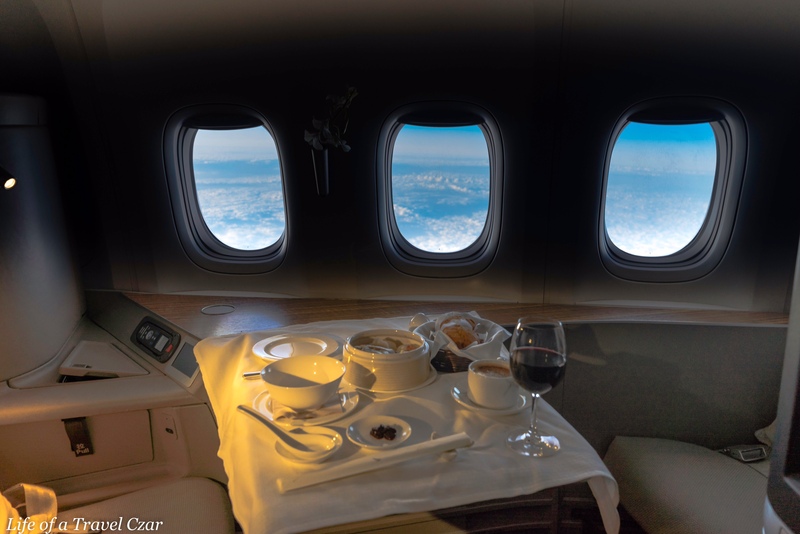 It is quite an experience to enjoy a fine oriental breakfast with a glass of wine and gaze at the clouds and the blue sky as the sun’s rays fight through and enter cabin. It is such a dream, for while our focus may on the small things in front of us (even a delicious breakfast platter), the world has a sense of limitlessness which should capture our imagination. It was an amazing flight, although I was super tired and slept for most of the night. On that note, the bedding was plush and comfortable as were the pyjamas. 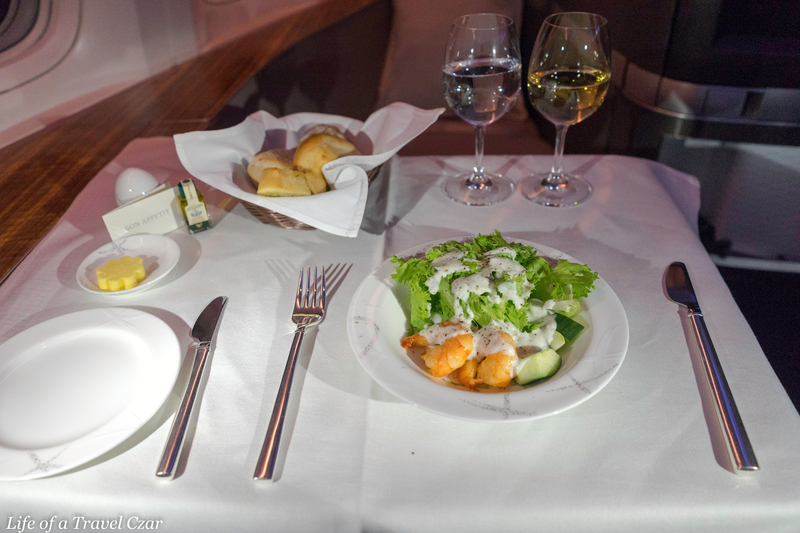 The dining service was lovely, although I did slightly prefer some of the dishes from the New York flight. The wine list didn’t disappoint and it is such a privilege to have some aged wines onboard. Much like the prior flight, the service was flawless. Never a moment where something was missed, forgotten or ignored. The cabin crew were super engaged and went the extra mile. 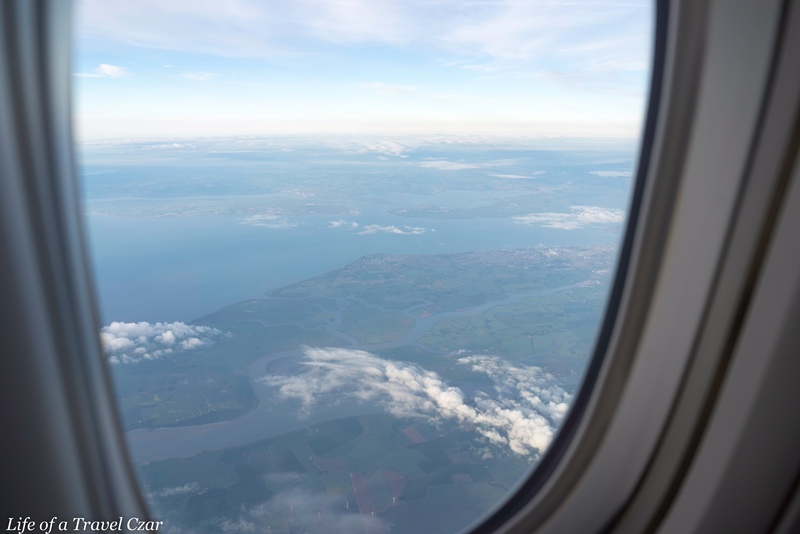 The views, post the break of dawn, were amazing and the inflight entertainment was really good although I did spend most time napping or gazing out the window. A very solid First Class service and product from Cathay. I did pull together a video of bits of the flight including the descent over London. 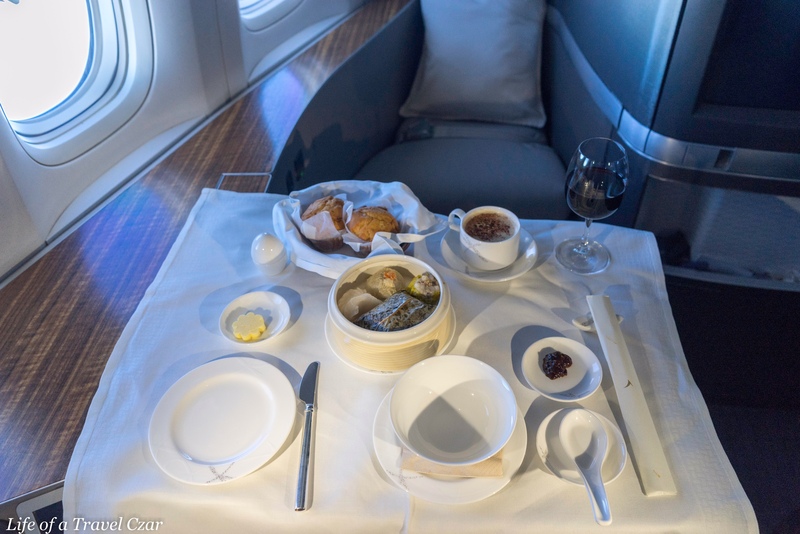 The video starts in the Cathay Pacific First Class “The Wing” Cabana in Hong Kong and has some lovely clips of the caviar course, breakfast, the clouds and the landing. The background music is from ‘Jubel’ by Klingande. I do not own any rights to the song.